"After my first session, I felt an opening in my back that I haven’t felt in a long time. I felt stronger to my core. That radiating, burning heat pain that I was feeling seemed to dissipate a little bit and it seemed to just open up my back in general." "I’m doing things in just a few weeks that I haven’t been able to do for years. I have five grandchildren and I can actually bend down and pick them up. It’s just such a joy to me." "I hurt my back L4-L5 25 years ago and struggled through different trainers and processes. I’ve tried everything from trainers to witchdoctors. After Ian’s program, I’m doing things I thought I’d never be able to do before. My back doesn’t hurt." "Being a medical professional I was skeptical from a standpoint that you might cause more damage, more trauma; but yeah, I was skeptical until I tried it. I came in hobbling and left walking." You see, there’s a reason nothing you’ve tried has healed your back pain. And it’s not your fault. It’s because mainstream medicine doesn’t know enough about the REAL cause of back pain. There's still hope. 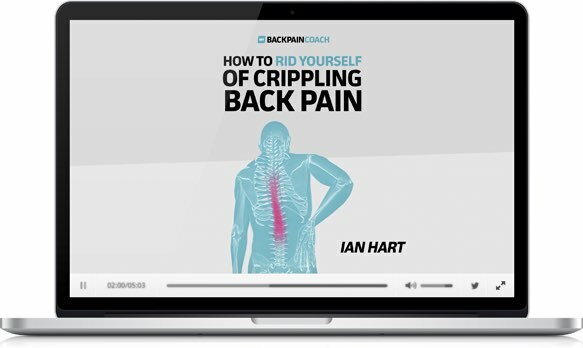 Let me show you simple ways to start relieving your pain.